At home and abroad, Americans are on a killing spree. I struggle to understand what’s driving our propensity to violence. As a nation, we also seem to have become numb to this violence. We do little to nothing to address the scourge of young, white, male loners who go on killing sprees in our schools, colleges, cinemas, and other public places. Our guns, it seems, are more sacred than the lives of our children. Then there are cases of policemen who go rogue. What’s more, they show a preference for African American targets. Anything – even daring to look at them – is an excuse for killing. Peaceful demonstrators against such injustices must face a police force armed for war. It gets worse. Our highly trained armed forces, equipped with the most advanced killing machines, are on an unending killing spree in Iraq, Afghanistan, and now we’re putting “boots on the ground” in Syria. Our tax dollars is funding this killing spree of innocent people – women, children, and other non-combatants – caught in the crossfire of waging armed forces. Even the wounded being treated in hospitals are no longer safe. 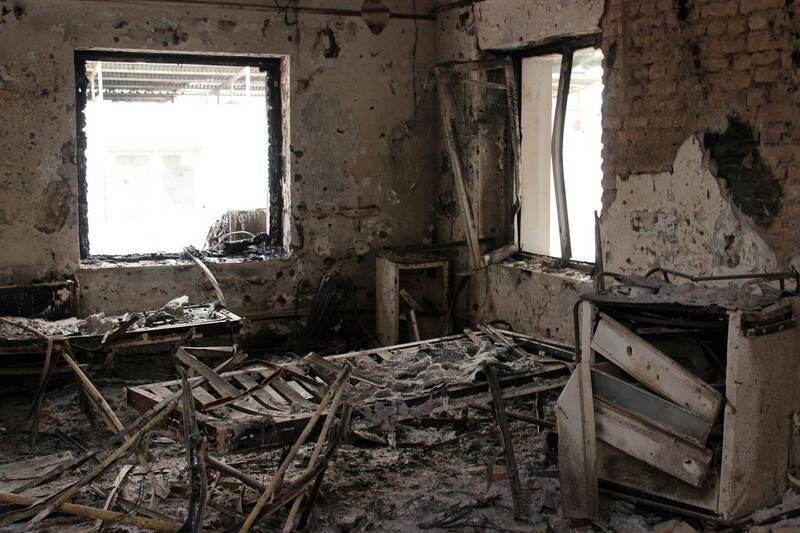 On October 3, our air force bombed a 140-bed trauma center in Kunduz, Afghanistan, run by the humanitarian organization Doctors Without Borders (MSF), killing 13 staff members, 10 patients, and 7 unrecognizable bodies yet to be identified. Because of our endless killing spree, millions of people have fled their homelands in search of refuge. Because of our endless killing spree, we are feeding the monster of our own creation. What’s happening to us as a people, as a nation? We seem to have lost regard for human life, especially when that life is non-white, communist, or Muslim. The blood of millions of innocent victims among the rubble of our killing fields now flow through our veins. Yes, whether Americans accept it or not, we the people also share the guilt for these war crimes against humanity. It’s no accident that zombies – also known as the walking dead and the undead – are now part of our pop culture. We are fast becoming a nation of zombies under the spell of the ruling One Percent that feeds on misery, chaos, disasters, and warfare. We can break this spell, reclaim our humanity. We can say no to endless war. We can work towards a World Beyond War. The choice is ours. To understand the dynamics of America’s endless wars, I recommend teleSUR’s Empire Files exploring the U.S. Empire, its rise to world hegemony and its impact on people and the planet. The first file, The Rise of History’s Biggest Empire, was released on September 5, 2015. To respond only to one portion of this excellent post, I find the job of the police to be more complicated than many in the press suggest. Having treated quite a few policeman, it is essential that they have the psychological ability to “command” a situation and to be “imposing.” They need to give those who might do harm to themselves or others a “don’t even think about it” realization that they shouldn’t challenge the officer. Weakness or even reasonableness is sometimes less important than establishing control. To do otherwise risks even more harm to the public and to themselves than otherwise occurs. I realize this probably sounds unsympathetic to those who have been unfairly injured by law enforcement officers. I am not trying to defend the policeman who resort to brutality. I have come to recognize, however, that the line between establishing order for everyone’s good and going over that line is a difficult judgement call that usually occurs in a fraught situation. Dr. Stein, thanks for throwing light on this contentious issue that puts poor African American families at great risk. From your clinical experience, it’s clear that the processes for the selection and training of our police officers need re-evaluation. While working in a busy uniform store in the western suburbs of Chicago for 22 years, I was in contact with police officers and firefighters all day long. It was a rare occurrence when a customer became unreasonable, my guess is most cops (M/F) would rather be doing something else, and the number who turn bad or commit crimes is no more or less than the percentage who do so in the general population. Look at it this way, police officers weren’t responsible for the millions of American jobs outsourced to China, Vietnam, Myanmar or wherever the corporate chiefs could find the cheapest labor, elected representatives passed the harmful trade deals, but they are the ones who face the negative consequences. I share your view that bad cops should not be defended, but face prosecution like all people. The police brutality issue is in need of attention and reform, but it’s more symptom of a larger problem than the disease itself. Many officers come from the military suffering from PTSD from war experiences, others depending on their city’s crime rate suffer PTSD as well, so who knows how many are taking SSRIs, prescription psychotropic drugs which have such horrific side effects they in my view should be taken off the market. I’m pleased your wrote this, Jerry. I think it speaks to the enormous complexity of an issue that is simplified as one of those good/bad public concerns we encounter in large quantity. I, too, saw (in my police patients), the stress of the work, the PTSD, the drug issues, etc. I make no claim to having seen a representative sample. I don’t believe there are always two equally worthy sides to an issue and I wouldn’t care to weight the concerns with respect to police interactions with minorities of any kind. The evidence of abuse of power leading to brutality is clear, but we do ask a lot of those who stand in harms way every day, whether on our streets or in a foreign land. Jerry, thanks for sharing your experience and insights of the problems that our police officers face in doing their job. As Dr. Stein also pointed out, police brutality is more complicated than meets the eye. For the good of us all, I hope that we find a way to turn this situation around. Thanks for sharing, Rosaliene. The interesting contrary view is hundreds of millions in my region are thankful for the long term peace and prosperity brought. Re-won from the great suffering of WW2, saved from the communists. Even in Syria, the current regime killed much more Syrians, doctors and is the main cause of the refugee crises and the suffering of millions. https://en.wikipedia.org/wiki/Bashar_al-Assad#Damascus_Spring_and_pre.E2.80.93Civil_War:_2000.E2.80.932011. Nothing in life is perfect, mistakes will be made in attempts to bring peace. The question is how to reduce the suffering of the Syrian population and the refugee crises. Leaving the current regime in charge may not be the best option? Cicorm, thanks for sharing your own life experience in the region where you live. True, “nothing in life is perfect.” But when our peace and prosperity come with such a high price tag of millions of lives within and beyond our borders, I wonder about the nature of such peace and prosperity. Who prospers? Who are left behind? How long will it last? At what cost to the ecosystems that sustain our lives? Thank you for sharing, Rosaliene. Peace and prosperity in itself is not bad. 1/2 billion people have been lifted our of poverty over a few decades, more than any time in history. No poor countries by 2035. Aid from other richer countries. This is important for the long term peace of the world. Rather, most of the suffering of the last fifty years (billions) are caused by corrupt governments and could be stopped if corruption is removed at all levels. On the climate, great improvement is facilitated when most are willing to make sacrifices e.g. no carbon fuels. The economic pain will be bigger for the less wealthy: how can change occur if 50% is do not believe, and when the economic impact for lowering carbon is felt, even more will resist and good leaders will be needlessly blamed for higher costs? The key problem is the general climate apathy. It would be great if “climate and we” channels have larger readership, vs “emotional and me” channels. Masterpiece of a film, Rosaliene. Thanks for sharing it. Wow. Jerry, which film are you referring to? After reading Cicorm’s comment, I updated my post to feature teleSUR’s THE EMPIRE FILES documentary series, launched in September 2015, which attempts to show us how we got to our state of endless wars..
Don’t know why, but replied to Dr. Stein on a post with the documentary “Human: Volume 1″… In WordPress reader, when one clicks on the title of a blog post you don’t go the actual blog but a generic version of the post (where I viewed “Human”), but clicking “visit” takes you to the person’s blog (where I’m typing this, without the film “Human”, but an image of Kunduz hospital, with link to “Empire Files”). Seems you had originally posted “Human”, removed the film, then updated/replaced film with link to Ms. Martin. Anyway, “Human” deserved a best documentary Oscar if made before 2015, or if just released deserves the next Oscar award. Empire Files ain’t chopped liver either. Sorry about that, Jerry. It was my error in updating my blog post to feature another documentary film. I agree with you that the documentary film HUMAN is a masterpiece and deserves an Oscar Award. It’s a three-part series worth viewing. I watched it in two sittings. I’ll feature it in a future blog post. America……culture of violence and death. Sad. Thanks for your comments, Sirenagx. True, I have left out all that’s bad in our world that contributes to the violence and wars in the Middle East, Africa, and elsewhere. I chose to focus on the USA because, as the sole superpower, we control the game. I agree, “we need stronger UN and enlightened US voters to better deal with these problems.” It’s my hope that blog posts like this one will raise awareness and stimulate discussion among US voters. I share your hope that better leadership will emerge world wide. Re-reading these comments, yours above, Rose,, and those from Sirenagx, I must agree with you – the US does control the game, in more ways than we’re even allowed to know and should be the focal point of the world’s growing and more deadly violence – who do you think feeds the world’s ever growing arsenals? Does capitalism, aka US Inc, give a damn about who it kills, what it destroys? I insist that hope still exists but it’s getting harder and harder. Thanks for sharing, Angela. Does US Inc “give a damn about who it kills, what it destroys?” Evidence indicates that it does not. I must admit that recent developments in US politics lead me to agree with your last comment. More about this in my December 13 post. Thank you for these crucial observations and well-founded critique of the continuing US use of force and violence to maintain the global control and privileges of the wealthy few. We all pay for this in many ways, as will future generations. Thank you for your reply, Rosaliene. I truly wish we had made a wiser decision. I think it’s really important to look at the reasons for the US military aggression in the Middle East – namely to exploit oil and natural gas resources in the region. As Derrick Jensen states in Endgame, people never voluntarily relinquish their resources to capitalist empires. I personally believe this kind of violence can’t be stopped without ending capitalist rule. Dr. Bramhall, thanks for reminding us that these wars are really about grabbing resources. So many of the documentary films you share throw more light on the ways Big Business uses its political clout to further its goals in gobbling up the Earth’s resources. Our man-made capitalist corporate beast knows no limits. Unless we stop it, it will continue growing until it self-destructs, taking humanity down with it. With all these excellent comments to your excellent post, Rose, I can add only 2 late thoughts 1) cops in Britain don’t carry guns and 2) capitalism tends to consolidation and we are certainly on our way in America. Quote from the article: We [Americans, or as I now call that people, Unitedstaters] seem to have lost regard for human life, especially when that life is non-white, communist, or Muslim. The blood of millions of innocent victims among the rubble of our killing fields now flow through our veins. Yes, whether Americans accept it or not, we the people also share the guilt for these war crimes against humanity.” The problem with that is the belief that “Unitedstaters” ever had respect for human life: they never did, and their history, all of it recorded in words, makes that abundantly clear. What the people have to do is change: they cannot look back and say, let’s be that way again.